WIN! Valentine’s Day is fast approaching which means one thing: it’s time to get your date-night look sorted. 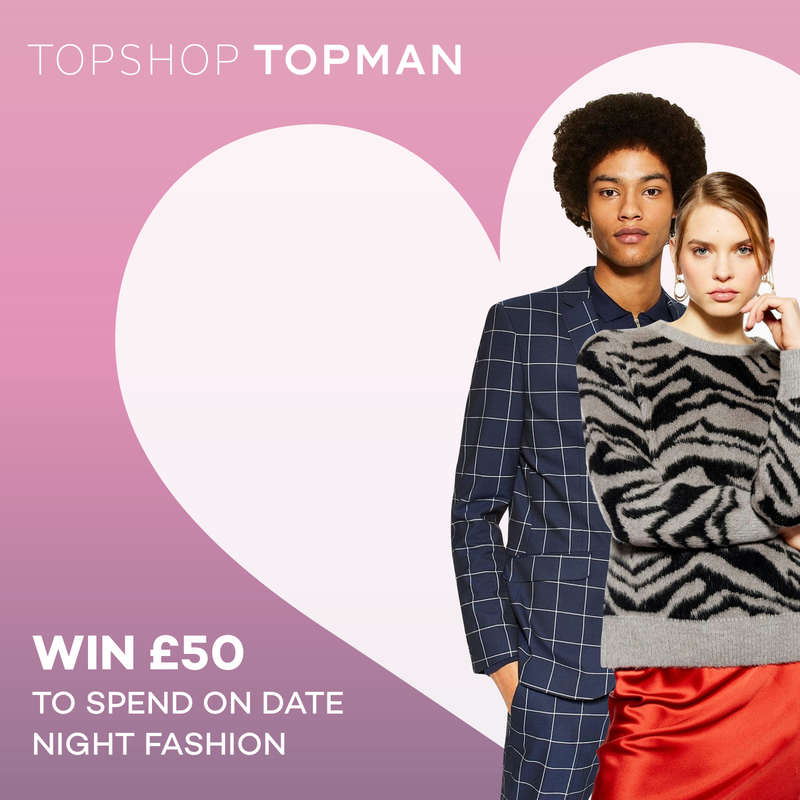 We’ve teamed up with TOPSHOP/TOPMAN to give one lucky winner the chance to score a £50 gift card to spend getting your love look sorted! So who’d like to win? To enter head on over to our Facebook Page and leave a comment telling us the best Valentine’s gift you ever received? If you already liked us on Facebook and would like to be included, please leave a comment telling us best Valentine’s gift you ever received? 1.(“Terms”). By entering the promotion, all entrants will be deemed to have accepted these Terms, so please read these Terms carefully. 2.The competition is open to all UK residents aged 16 years and over with a UK postal address except persons connected with this promotion. 3.The closing date is midnight 12 February 2019 and the winner will be notified by 5pm, 13 February 2019. To enter like Ayr Central on Facebook. https://www.facebook.com/AyrCentral/ and leave a comment telling us the best Valentine’s gift you ever received? If you already liked us on Facebook and would like to be included, please leave a comment telling us best Valentine’s gift you ever received? Good Luck! The prize is a £50 Gift Card to spend in Topshop/Topman at Ayr Central, Ayr. 6. Ayr Central reserves the right to substitute a prize or part thereof with a prize of equal or higher value in the event of unforeseen circumstances and/or withdraw or amend the promotion at any time without prior notice. 7.The prize winners will be notified via Facebook and the prize must be collected in person from Ayr Central. 8.Should the prize winner be unable to accept the prize or not respond to Ayr Central within the same day of the notification date, Ayr Central reserve the right to draw an alternative winner. 9.There are no cash alternatives: the prize must be accepted as offered, is non-transferable, subject to availability and cannot be exchanged. 10.The prize winner may be required to take part in some promotional activity as a condition of receiving the prize e.g. publicity photos. If you are required to take part in such promotional activity, you agree that we may (but are not obliged to) use your images and/or any footage in which you appear in our promotional campaigns, which may include press and magazine advertising, direct mail, outdoor advertising, transport advertising (such as buses), social media advertising (such as Facebook and Twitter), in-centre advertising (such as floor graphics and banners), leaflets and flyers and on our website. You will not be entitled to receive payment for any such use by us of your image or footage in which you appear. 11.The selection is final and no correspondence will be entered into. 12.Ayr Central cannot accept any liability for any entries which are late, lost or incomplete. 13. Entry into the competition constitutes acceptance of the above terms and conditions. 14. Failure to comply with these terms and conditions will automatically render a prize draw entry void. These terms and conditions shall be governed and construed in accordance with Scottish law. 15.The name and county/town of the winner will be available for one month after the competition closing date by sending a stamped addressed envelope to the promoter Ayr Central Shopping Centre. 16. This promotion is run by Ayr Central Shopping Centre. 17. Any queries in relation to this promotion should be directed in writing to Ayr Central Shopping Centre, Management Suite, Skye Square, Ayr, KA7 1TP. 18. These terms and this promotion are governed by Scottish law and you submit to the exclusive jurisdiction of the courts of Scotland.